A beautiful card from the one and only Beate Johns!! I had seen this card on her blog, but let me assure you--it's even better in person!! Thank you so much, Beate!! Good morning!!! I have added a new album for the cards we do at my card club each month!! I will add to this each month, after our meeting!! P.S. I have one opening in the card club--we meeting Friday nights at 7pm--let me know if you're interested! Good morning!!! I wanted to share this beautiful card I received from Sherrie!! She is my "upline"--which means that I signed up as a Stampin' Up! demonstrator under her. She is in Ohio, and I sure do miss her!! She sends me great cards, gifts, etc all the time!! She's just the best! 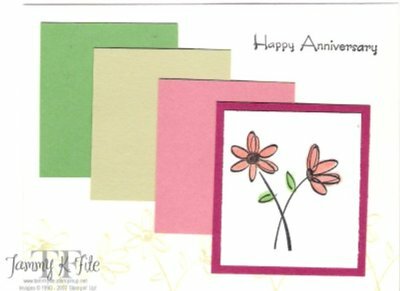 Isn't this a soft and elegant card? I absolutely love the ribbon--what a great idea!!! Amy is the creator of this beauty!! Here's my interpretation of this week's sketch challenge! I didn't stamp at all! 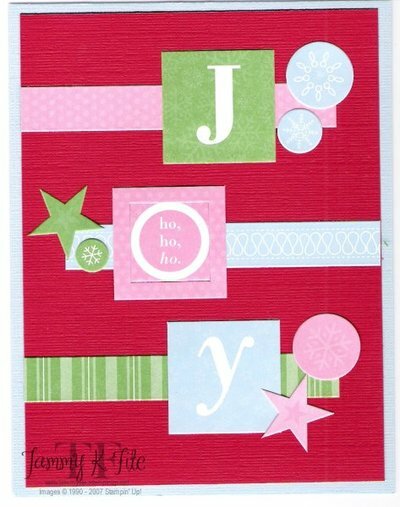 I used the new Winter Bright Simply Scrappin' Kit from Stampin' Up! It's a great kit, with wonderful colors!! And, it has the textured cardstock--see the red cardstock?! It's beautiful!!!! 6 sheets of exclusive, self-adhesive die cuts! This is my new favorite set!!! And, I don't even own it!!! I have seen soooooo many great ideas using this set--someone even made a ladybug from the petals!! Anyway, this is the card Brenda did for our New Catalog Set Swap!! 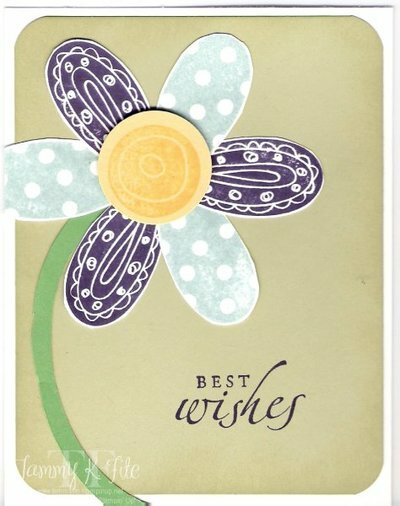 Pick a Petal & Sincere Salutations Stamp sets. P.S. Have you noticed all the River rock being used? It's very versatile, and will "match" just about anything!! Here's another card from my new set swap!! What a unique card--a great layout!! 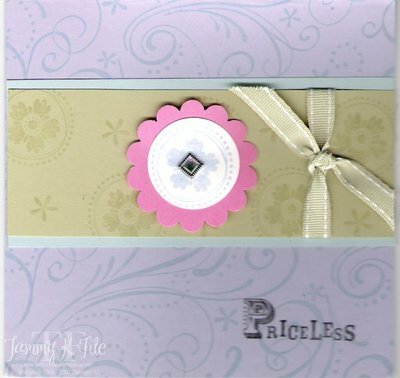 Selene used the Three for You Punch Box--love those little flowers! The cardstock is Basic Black, Soft Sky & Whisper White. She also used the new Prints Designer paper in Soft Sky. Other items used were dazzling diamonds glitter, black brads & black gingham ribbom. Hi!! I have been stamping all day! We're having our first Card Club meeting this Friday night, and I've been "creating" all day!! I'm pooped!! :-) I'll post the cards next week sometime! Here's a card I did for Beate's sketch challenge. You can see the sketch here. I used the new Winter Bright Simply Scrappin' Kit. It's soooo pretty!! And the textured cardstock is to die for!! 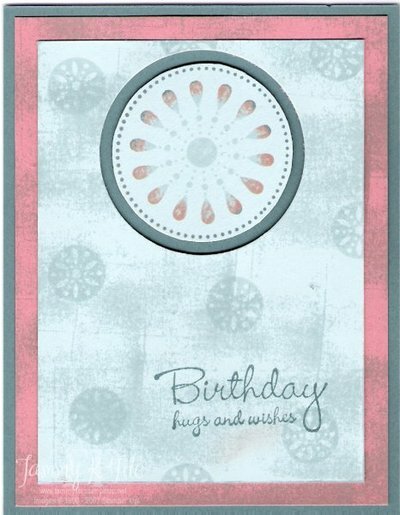 There are 8 sheets of the textured cardstock in each simply scrappin' kit!! No stamping involved at all on this card. 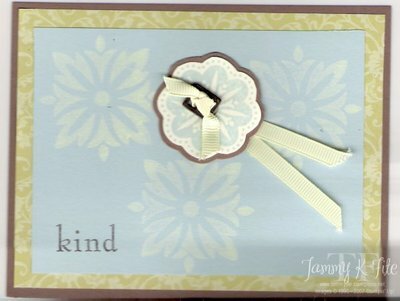 I did use some whisper white cardstock behind the striped piece, and behind the sentiment. Other than that, it's all from the scrappin' kit!